Rachel Von | The Journal Gazette Homestead freshman Halle Weaver swims to a runner-up finish in the 200-yard freestyle Saturday. “She's a freshman, she's a freshman,” rang out from the Homestead student section when Kyra Tonsil was given her first-place ribbon for winning the 50-yard freestyle. With a time of 23:82, the freshman helped Homestead win its second consecutive sectional title with a score of 529, edging Carroll's 520. Concordia placed third with 252, Bishop Dwenger was fourth with 219 and Snider was fifth with 179. “It makes it feel like all the effort I've put in this season is paying off,” Tonsil said. Tonsil was one of 11 underclassmen in the sectional who took home a first- or second-place ribbon – most of whom won multiple events. Sophomore Audrey Crowel won the 200-yard freestyle with a time of 1:51.90, and freshman teammate Halle Weaver placed second with a 1:55.32. Sophomore Maggie Stock took the top spot in the 100-yard freestyle in 51.31, and Lily Kaiser took the blue ribbon in the 500-yard freestyle with a 5:06.85 to name a few of the Spartans' young guns. Homestead coach Justin Max said his underclassmen's performance indicates how bright the future is for the Spartans. “A couple of these girls have won individual events for a couple of years already, so I think they get a lot of confidence out of knowing they've been here before and performed the way we hoped to,” Max said. Homestead senior Jackie Brenn dominated the 1-meter dive, breaking her own sectional record with a score of 548.40. After winning an individual state championship in 2016 and placing runner-up last season, Max said Brenn has the skills and work ethic to match to make a run for another state title. “I usually say she's everything you could want from an elite-level athlete,” Max said. Brenn will be joined at the diving regionals Tuesday by Dwenger's Anna Yaggy, Carroll's Kaylie Cripe and Emily Linder. Carroll junior Mallory Jackson has owned this sectional since she was a freshmen. The Wisconsin recruit, who was runner up in the backstroke at state last season, won the 200-yard IM with a time of 2:03.06 (breaking her own sectional record), the 100-yard backstroke with a time of 55.11 (breaking her own sectional record) and was part of the 200 and 400-yard freestyle relay team that also took the top spot. 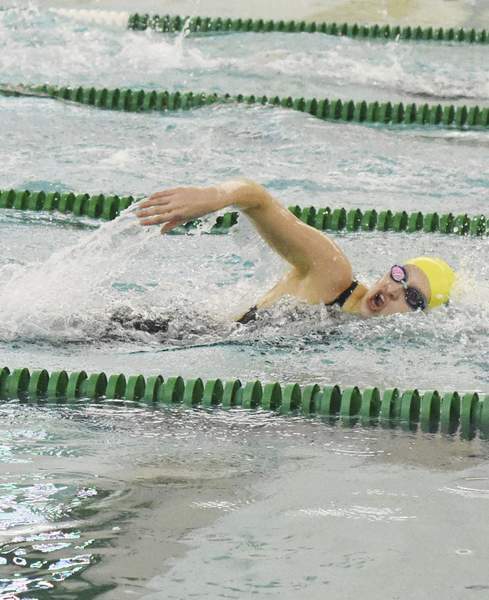 “That backstroke is as fast as she's ever been here and she's obviously the favorite going into next weekend, and I think she showed why,” Max said of Carroll's best swimmer.